" ... Inside [von Brunn's] house, officers found "Liberalism is a Mental Health Disorder" by radio talk show host Michael Savage, "Let Freedom Ring" by talk show host Sean Hannity, and "The O'Reilly Factor," by television talk show host Bill O'Reilly. ... The Republican hysteria over the DHS report -- which was, by the way, initiated by a Bush administration official -- was always based more on a partisan scheme than reality. ... "
Posted by Steve Benen, Washington Monthly, June 10, 2009. In light of the shootings at the U.S. 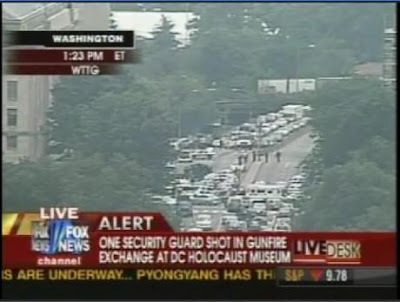 Holocaust Memorial Museum in D.C. this afternoon, allegedly committed by white supremacist James Von Brunn, Matt Yglesias noted, "I hope that everyone who mau-maued the Department of Homeland Security for expressing concern about this kind of thing feel appropriately ashamed of themselves." It's hardly an unreasonable point. Two months ago, Richard Poplawski, a right-wing extremist, allegedly gunned down three police officers in Pittsburgh, in part because he feared the non-existent "Obama gun ban." A few weeks ago, Scott Roeder, another right-wing extremist, allegedly assassinated Dr. George Tiller in Kansas. A few hours ago, Von Brunn, another right-wing extremist, allegedly opened fire at the U.S. Holocaust Memorial Museum. The shotgun-wielding suspect in Sunday's mass shooting at the Tennessee Valley Unitarian Universalist Church was motivated by a hatred of "the liberal movement," and he planned to shoot until police shot him, Knoxville Police Chief Sterling P. Owen IV said this morning. Adkisson, 58, of Powell wrote a four-page letter in which he stated his "hatred of the liberal movement," Owen said. "Liberals in general, as well as gays." ... I am suggesting that it makes sense of the Department of Homeland Security to coordinate and communicate with law enforcement agencies about potentially violent extremists -- of every ideological stripe -- to help prevent tragedies like the ones we've seen lately. The DHS report specifically addressed the possibility of violence from anti-abortion radicals and anti-Semitic extremists. And in the last two weeks, Tiller was assassinated and a white supremacist opened fire at the Holocaust Memorial Museum. The Republican hysteria over the DHS report -- which was, by the way, initiated by a Bush administration official -- was always based more on a partisan scheme than reality, but the incessant complaints look especially misguided today.